The Daily Lew | Watts Up With That? I have several phone conversations scheduled for tomorrow, Monday, W.A. time, with the ethics committee at my university. I will report on the outcome as soon as a decision has been finalized. No news, and it is 4AM Tuesday in Australia as of this writing. I wonder what the ethics committee said? Maybe they pointed out more ethics issues than Dr. Lewandowsky expected? Please find enclosed correspondence from my research assistant dating back to 2010. He contacted you at the time to ask whether you would post a link to one of my research projects on your blog. There appears to be considerable public interest in the identity of the bloggers whom I contacted for my project in 2010, and I am therefore pleased that my university has today affirmed that there are no ethical issues involved in releasing their identity. I will post the relevant information on my blog shortly. So at various points, they’re linked to anti-Semitism, a black rapper named Sister Souljah who wanted to kill several whites every other week to compensate for the fact that blacks kill each other, to moonlanding conspiracy theories, and so on. “Lewandowsky, like Gleick, probably fancies himself a hero of the Cause. But ironically. Lewandowsky’s paper will stand only as a landmark of junk science – fake results from faked responses. And it turns out Pielke Jr. was contacted as the Third Skeptic. [auto-reply from Stephan Lewandowsky] Note that although I endeavour to keep all email correspondence private and confidential, this does not apply to messages that are of an abusive nature. The “smoking-doesn’t-cause-cancer-conspiracy” is a signature of a fake response…The points that are on the top left of the graph are the more outlandish conspiracies, especially the “smoking” point which ranks right at the top. In my opinion this is a signature point. Skeptics don’t believe that conspiracy, but alarmists have been trained to think skeptics do. The high rank there is the “Oreskes Effect”. After 120,000 comments on this blog, I can’t recall a single skeptic who thinks smoking doesn’t cause cancer, nor do I remember reading a comment on it on any other skeptic blog, nor have I even heard a hint of it in an email. But the two issues are often tied in alarmist propaganda.. Frequently people like Naomi Oreskes claim Fred Singer and others have doubted that smoking causes cancer, something which is an outright misrepresentation (see my point #3 here). Singer wrote about the statistical failures of the passive smoking case, which is scientifically entirely different from the well documented link between smoking and cancer. Given that this dishonest material is circulated widely on alarmist blogs, it’s likely that all 11 of those responding “yes” to that conspiracy question are the fakers, dutifully ticking off the boxes they have been trained to tick. I agree. For the record, both of my parents were heavy smokers, but suffered major smoking related health issues, and both died prematurely of them. As a small child, I got many ear infections (and I still do). This resulted in me being treated with Tetracycline, which has been known to cause hearing loss and now discontinued from general use due to that and teeth yellowing (which I also have). My hearing loss affected me greatly through my childhood and teens, caused me all sorts of problems in college (before the Americans with Disabilities Act required accommodations), and ultimately led me to my career path of TV Meteorology where I didn’t have to listen, but talk the camera. So if anyone wants to label me as some sort of “denier” about the health effects of smoking, let’s step outside this blog and have a conversation about that. Shortly thereafter, the first of the 5 bloggers, Mr McIntyre, found his misplaced email. This leaves us with 4 bloggers whose identity had to remain confidential until now. I am pleased to report that I received advice from executives of the University of Western Australia earlier today, that no legal or privacy issues or matters of research ethics prevent publication of the names of those bloggers. Of course, having failed to communicate effectively, he went ahead and did a paper with one sided results. I don’t think they understand how fragile their survey was and how easy it was to create fake responses. Instead, they assume they are accusing Lewandowsky of dishonesty, where the accusation actually lies in the realm of incompetence. That’s not what the reference to Sister Souljah means. He is referring to Clinton’s attacking of Sister Souljah, and saying that’s what someone needs to do here. Lewandowsky seems to have entered an epic meltdown (too much CO2?). And what gave him the idea that Pielke Jr. is a climate skeptic? It’s futile to point out the logical failures of this sort because logic is lost on the true believers. They believe what they want and no amount of facts and figures showing them where they’ve gone wrong will convince them otherwise. I tend to think that the alarmist vs skeptic debate is less about real science (in the case of the alarmists) and more about psychology. When it’s all over I think the psychologists will study this for years. You tell it Anthony. I have experienced the tragedy of the smoking-cancer connection. Those that believe otherwise are ignoring the data and in my experience number only a few folks. If the results of the survey show a connection between disagreeing that smoking causes cancer, and CO2 causes global warming, the connection is a huge red flag planted on the head of a fake responder. I think the major problem with Lew’s “Sister Souljah” post is that he is evading all of the genuine issues about his incompetence, criticisms of his study, etc. by trying to change the subject. His proposed “Sister Souljah” moment is for climate skeptics (in Australia primarily) to distance or dissociate themselves from the “Galileo Movement” there. The analogy is supposed to be that as Bill Clinton criticized Sister Souljah for her offensive lyrics etc., so are climate skeptics to criticize the GM etc. Whatever possible criticisms might be made of anyone in the GM (I don’t follow them and don’t know enough about them to comment), that topic is a DIVERSION from real objections which have been raised about Lewandowsky’s work. Professor Lewandowsky is beneath contempt. Rather than saying that “Skeptics don’t believe that conspiracy” (moon landing), it would be more accurate to say that skeptics don’t believe that conspiracy any more than warmists do. As in both sides you can find all kind of weird people, and among them, probably a few moon-landing-conspiracists. Thanks, Anthony, I think it is very helpful to bring the various Lew links together here, for one new discussion thread. It’s also may be the closest approach to “15 minutes of fame” that execrable ideologue Lewandowsky will ever attain, so he should be grateful, too! I am still filled with astonishment that he is supposed to be a PhD and even a Professor of some kind! Nothing much should surprise us anymore, but this “study” really should not pass muster in a first-year undergrad course. What happened to academic and scientific standards? Anthony, it’s worth remembering though that the debate about the health effects of smoking itself is a far cry from the debate about the need for the sort of smoking bans and persecution of smokers that we’re seeing today. Ear and throat infections have both been pretty clearly linked with parental smoking. If we believe that smokers don’t tend to get respiratory infections more often than nonsmokers then it seems very likely that the increased infections in the children are due to secondhand smoke. If we believe that the smoking parents DO tend to get such infections more frequently and pass germs on to their children then the causal effect comes into question: and I’ve never seen a study that corrected for that variable … though there may be some out there: it’s not an area I’ve examined that closely. You’re mentioned by name at one or two points as well I believe. What keeps me sane is the knowledge that scientists who overturned the jargon, or dogma of their day and who were chastised for it were found out, retrospectively, to have been correct, such as Galileo and Darwin.. Of course, we were not around when they were, so we don’t know the extent of the jeering and boo-ing. It is a failing on the part of rationality to advocate ad-hominem as a response, and therefore, the ideas of those committing ad-hominem ought to be examined. My late father smoked. He was of the generation where smoking was “just fine” and he even rolled his own – not even a cigarette filter to help. When lung cancer hit him, it was brutal and swift. To watch a strong man deteriorate as he did is a thing no one needs to witness. I need no lectures on the topic. My contempt for Lewandowsky, his ‘subject’ and his stance grows daily to almost Mannian proportions. Can the smoking and cancer question be interpreted to mean whether all cancer (even of one type of cancer) is due to smoking? Surely one can’t claim that all cancer occurrences are caused by smoking. This is far from saying that smoking will automatically give you lung cancer. Let’s not get emotional here. Can we say that smoke makes people cough… yeah, I think so. This is the elitist intellectual totalitarian playbook. When people do not go along with their rarified, enlightened world view, they decide that there are some regrettable problems that must be remedied. By elistist intellectual totalitarians. My political views are not easily penned in, and this is because I prefer evidence over political-party-based beliefs or the official government pronouncements. This matter of noting educational or psychological defects in those who do not play along is a growing theme. In the end, though, it is totalitarianism: the elistist intellectuals will let the rest of us know what is valid to believe and valid not to believe. I do not believe the govt developed the HIV virus in order to kill off Black people; I do see the attractiveness in this belief to some in the Black community, and I am in no rush to force these parts of the Black community to change their minds. Cass Sunstein is. He mentions this “conspiracy theory” as one of a few examples in his article, “Conspiracy Theories.” Written with A. Vermeule, so just google those names to pull up the article. In the article, Sunstein “suggests” a few ways that the ” government” (or, the Regulatory Czar) could counter any “conspiracy theory” that has been determined to be false enough, by a govt panel of presidential appointees, to need debunking. One strategy is disinformation on the disinformation by infiltrating the conspiracy groups. In John Holdren “Ecoscience” style, Sunstein can simply claim he was raising a high level discussion, and was advocating nothing of the sort. Yeah, right. Also coming out of the elitist intellectual totalitarian think tank is, from Communication Czar Mark Lloyd, advocacy for the return of the Fairness doctrine, and more. He and fellow travelers argue that the U.S. depends upon “deliberative democracy,” and that citizens must be sufficiently informed in order to be able to join in deliberations over how we govern. They then note a “problem:” we rank and file citizens have, with the ginormous EXPANSION of media and info avaiable to us, have foolishly stuck our heads in echo chambers. To solve this problem – lest our republic fall due to the demise of deliberative democracy, the solution is, again, a panel of elistist intellectual totalitarians appointed by the president to promote and comtrol “content” in the media – especially that most scary, effective media of all – gasp – talk radio. So, the govt would develop the “well-balanced mix” of what can ride the public airwaves. Thanks! Why did I not thik of this? Again, you see that the problem is defined as us plain ol citizens not being properly educated, and being susceptible to psychological flaws such as the human desire to stick head in echo chamber. In a related elistist totalitarian move, a high profile group on behalf of the National Cancer Institute took a quick glance, in 2003, at the epidemiological studies assessing whether abortion adds to risk of subsequent breast cancer. They said a clear “no,” although data are cetainly not definitive. The medical establishment has been free to carry on since then, and this has given new ammo to the opponents of that most threatening, scary group of volunteers, crisis pregnancy centers. Yes, those demon volunteers handing out diapers, getting low-income women linked with pregnancy/delivery medicaid, and offering to gasp – say a prayer with the woman, if she likes. I count about ten ABC studies that have emerged since the NCI panel and in my view the science is far from settled. Never mind new data. In 2011, Rowlands came out with a review (in the journal Eu J of Contraception and Reproductive Health Care) noting that the persistence of the ABC belief, and including that in decision-making, is either the product of people who cannot interpret epidemiological studies (I can, but he does not note me individually) or are up to no good. Elitist intellectuals bent on saving the planet from Paul Ehrlich’s impending population overload can rest assured that the opposition is either uneducated or in psychological delusion. Bryant and Levi followed in 2012 with more of the same: ABC education = “misinformation” (in the journal “Contraception”). If these elitist totalitarians do not nip things in the bud, it will be difficult for them to continue controlling population dynamics in all of those countries where we educated elitists have to keep throwing money, since those uneducated savages keep reproducing like bunnies without our oversight. That is the common strategy: discount disbelievers by labeling them as uneducated or psychologically misguided. On the other hand, we could value free speech, and continued inquiry into these issues. We also could emphasize NOT delivering a bunch of PC guilt onto kids as a proxy for education, but could actually educated the next generation in decent, thorough math, science, reading, writing, and critical thinking skills. Benezet 1935 is too good, and is a must-read. These schoolkids have the potential to be just as clever as any of us, but the opportunity will be wasted if they are “taught” jingoism about how mommy and daddy are killing the planet and how we could all live just fine if we reduced our carbon footprint to fit within the solar panels on our roof. I think I got through k-12, and college, just before the elitist intellectual totalitarian guiltucation took over education. In other words, it was found that 1 of 13 people will develop lung cancer from smoking… hardly a majority. Lewandowsky of course has built a strawman. He is now attacking the poor science that led South Africa to abandon anti-retroviral drugs, and comparing these people to climate skeptics. Wierd part is, when you point out that green groups did that with DDT and Golden Rice, they immediately say that I believe its all part of a conspiracy. Steve McIntyre has posted this not long ago on his site, which indicates what “ethical issues” were being considered. In the same SMc thread all five ‘sceptic’ blogs now appear to have been identified. I would have thought that the University should have been addressing what to do about Lewandowsky’s fake data. Yea, I would dispute that smoking CAUSES cancer, as there are many people who smoke and do not get cancer. However, making cancer more likely is solid. On the other hand, the effects of secondhand smoking are not well established. The EPA did a science fixed around the policy 20 years ago and concluded that secondhand smoking is a problem, and the methodology was very weak. Lewandowsky has created a sewer masquerading as science. Whatever he now adds to it, the product will always be pseudo-scientific sewage. It is no surprise that such a man resorts to abuse in response to valid criticism. The more Lewandowsky struts hubristically on his infamous stage ,the more the excellent reputation of the University of Western Australia and its alumni will be contaminated and decline by being associated with a man so lacking in judgement, sense and impartiality. There are many carcinogens used in our daily lives, smoking is one, asbestos (was/is) another, I seem to recall washing up liquid is another. Obviously there are many more. Does smoking cause all lung cancer; no. Does it cause some of the lung cancer; yes. I just found this post on Stephan Lewandowsky’s site under his most recent post. Does Lewandowsky warrant this level of interest? He seems to be an activist rather than a scientist and his work is clearly absurd. I hope the ethics committee pointed out that they take a very dim view of someone undermining the University’s reputation this way: that academics can’t use the good name of their University to try give credence to abysmal work which appears to have no purpose other than to denigrate some blog posters that he just happen to disagree with. No, he doesn’t but the paper was reviewed, published, and picked up by the press. There is definitely a language problem here. I believe that it is FALSE that smoking causes cancer. My Mom and Dad both smoked. (Both still going strong, no cancer.) My Mom at least a pack a day for over 40 years. No cancer. Ergo smoking does not cause cancer. 1. Dramatically increases the RISK of lung cancer. E. Other problems not mentioned above, but the list is extensive. Any of these problems WILL kill you. Sooner or later, and not a pretty way to go either. 3. Is just plain nasty. (In my youth) I never dated a smoker, not one single time. Smokers were automatically removed from the pool of potential mates. I read the question “smoking causes cancer” as meaning “the result of smoking is cancer”. This is not true, because a lot of people who smoke do not get cancer (especially those who set fire to their houses smoking in bed). The question “how many doctors think smoking causes cancer” was even more interesting, because I’ve never met a doctor who wasn’t extremely careful about what they say, does and doesn’t “cause” anything. After all, they regularly get sued for saying the wrong thing. I just could not imagine a doctor saying something as categorical as “smoking causes cancer” … because more than likely someone would spend all their money then start a civil action against the doctor because THEY DIDN’T GET CANCER when they had planned to die early. let’s face it, “Smoking causes lung cancer” is just a woefully incompetent statement, as are most statements on the survey. It is question that cannot be accurately answered, it is too open to interpretation. If the question was something like “Heavy smoking significantly raises the probablility of getting lung cancer.” Then you could give a reasoned response. AND…….. it is totally irrelevant who Lewy sent emails to. The only relevance is where he did the actual survey, and it WASN’T on skeptic blogs. I know that if I got an email with a survey like that, the email would be deleted and never bothered with again. JUNK MAIL and SPAM should be treated that way. always. How many people remember junk mail they deleted even last week !! Smoking may not CAUSE cancer, but the moon landings CAUSED aliens. Why are we even discussing smoking and lung cancer? The Lew uses this topic (and others) to slander skeptics and take the focus off AGW; by following this line we are doing exactly what he wants of us- he wins. Whether or not we smoke or believe smoking causes cancer has no bearing on the science or not of global warming. Let’s just stay on message: The Lew is a lewnie. For the record, I hate smoking and agree with Robert M’s points. It can cause grievous health problems in every part of the body as well as increasing cancer risk roughly 50-100 times. Small clarification: I have no evidence that The Lew is mentally unstable, so I withdraw that suggestion- but his paper definitely makes you wonder. How is smoker defined? I’ve read that anyone who smoked more than 100 cigarettes in their lifetime was classified a smoker and under 100 a non-smoker. There are a lot of variables that aren’t defined and to say “smoking causes lung cancer” is not scientific.” Why do people in some countries get lung cancer at a much higher rate than others? Considering the money involved, just like AGW, it makes one wonder about the results. AMA got millions to promote non-smoking along with millions more made available for promotion of non-smoking. No doubt, smoking is not good for you and certainly contributes to lung cancer. Any reliable study would have to include the occupational environment and lifestyles of the patients. For instance how is a smoking coal miner or an industrial worker classified? I just read an article in the Atlantic from 1956 on the subject and it was stated that city dwellers got lung cancer at twice the rate of country people. The latest is that lung cancer among non-smokers is on the rise. Smoking is a huge risk factor but he cannot be said to be the cause and I would never defend smoking, but the discussion is scientific not emotional. The problem with simply saying “We all agree that smoking causes cancer”, is that if it were true then all smokers must get cancer. Asbestos is a carcinogen, however not always. But if a smoker works in friable asbestos, their chances of getting lung cancer are six times that of a non-smoker. There have been too many marginal scientific studies published, and just like today’s CO2 bogus science, part of it is accurate, but part is inaccurate and anyone who points out the inaccuracies gets shouted down – shill for Big Tobacco, shill for Big Oil. Science goes out the window when PNS walks into a room. We need to fight all PNS occurrences, not just selectively select a few to resist. PNS has been here in other guises, it led directly to the Dark Ages. Thomas Aquinas saved us then with the re-discovery of Aristotelian logic, how long would it take in the future for people to rediscover logic? Why is SL not listing JunkScience as one of the skeptics contacted? They even posted a link to the survey, although heavily caveated. The link is titled: Attitudes Towards Science, about 1/4 of the way down this page. Lewandowsky deletes anything he doesn’t like. 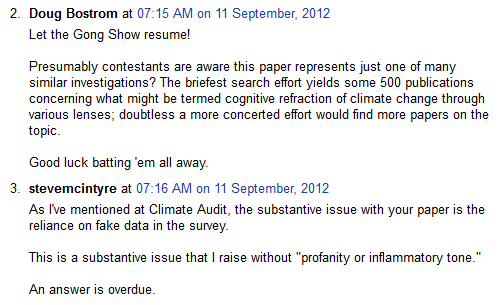 At the survey replication post, Skiphil showed us a good comment someone had posted at Lewandowsky’s blog. He was right on his prediction. The comment was gone from Lewandowsky ‘s blog very quickly. I recopy it here. It’s very accurate. This blog’s policies emphasize “civil and substantive” discussions and fostering “conditions for reasoned debate”. Do authors and members of the Editorial Board actually regard Professors Lewandowsky’s last several articles here as “civil and substantive”? Does the smearing of all sources of criticism foster “conditions for reasoned debate”? Across the academic and policy worlds this blog is an extreme outlier, a locus of reckless ad hominems and slovenly discourse. Its sponsors and and contributors should be deeply ashamed of what Professor Lewandowsky has done to this forum. Thank you for your consideration. Meanwhile over at Pointman’s blog (http://thepointman.wordpress.com/), Lew has shot from relative obscurity to second spot in voting for the Climate Prat of the Year Award. Aussies in the first three places. Dear O dear. I currently smoke 3 pack per day. (Marlboro Light 100s). I am aware of the risks. I have no male ancestors, back to great grandfather, who lived past 70. I have many female grandmothers who live into their late 80s and early 90s. I drink heavily too. And again I am absolutely convinced that what I am doing to myself reduces my life expectancy. OTOH, I do not believe that the CAGW hypothesis is correct. I won’t get into the smoking diversion. I do have a question though about the Lewpaper. Are any of the warmist main players still using this paper for anything other than what it really is? Is it being taken seriously? On smoking causing cancer, as several folk here have noted, it’s not inevitable, but is perhaps one of those things that depends on genetic makeup. From what Anthony says, clan Watts must have a particularly susceptible gene somewhere, if both parents and at least one of their children have succumbed to tobacco-related problems. (Might be worth offering a DNA sample to some researchers somewhere? – Just a thought, I’d consider it.) Also, it depends what you smoke of course. On politics, thelastdemocrat says: “One strategy is disinformation on the disinformation by infiltrating the conspiracy groups.” – Yes, that’s probably the commonest strategy “they” use. I can’t think of any current protest groups that don’t show signs of having been taken over: did no-one else notice how the “Occupy” protesters were “proposing” economic policies originated by the international bankers? Tea Party? Compromised. Show me a grassroots oranisation today, I’ll show you a compromised, astroturf organisation tomorrow. If you want to revolt, don’t form a “movement” or it will be infiltrated and corrupted just as soon as it gets out of your direct control. Just … do it, if I can say that without WUWT getting sued by a well-known sprtswear company. On Lewandowsky … (snort of laughter) … it just gets better, doesn’t it? Puts your own problems in perspective. I will say again that I believe that people are giving this outlier Lew to much credit and should just be ignored as he is simply trying to prompt PR for his cause. As I sure most commenter’s here are aware people like Hansen and Mann are the people to watch and as this year has shown all they have left is begging people to believe them on twitter. Let them preach to there believes just question there LOL science when they finally try and fake some more. I made the first comment, and I quoted Tom Curtis, and I linked to the original location of Tom Curtis’ comment at Sceptical Science..
“Secondly, Tom Curtis at the ‘consensus blog’ – Skeptical Science’ one of the so called ‘pro-science’ blogs surveyed had this to say about the paper and its data. Perhaps a response from the authors is due. The above comment lasted at http://www.shapingtomorrowsworld.org for SIX days before being removed. I’ve attached before and after screen captures. [SkS]Moderator Response: [Dikran Marsupial] [Mildly] Inflamatory snipped. Discussion of this topic is becoming a little too heated. Please can we all keep the discussion as impersonal as possible, and based purely on reason [for which Tom rightly has an excellent reputation IMHO]. Why are we even discussing smoking and lung cancer? I answer: because it goes to the heart of what is wrong with the survey. Smoking greatly increases the risk of acquiring cancer (and several other diseases) but it does not cause cancer. This is similar to the difference between walking through a forest or along a country road: walking along the road does not cause a person to be run over but it does increase the risk that they will be run over. Scientifically literate people will understand the difference between “cause” and “increased risk” so are likely to answer “No” when asked “Does smoking cause cancer?”. So, what do you know from the survey if it indicates most climate realists don’t agree that “smoking causes cancer”? Does that result indicate they reject the scientific finding that science greatly increases the risk of contracting cancer? Does that result indicate they are more scientifically educated so have an above average understanding of the principles of causality? The result of that question can be asserted to indicate either possibility. Simply, their answer can be interpreted to indicate that they accept “science” or that they reject “science”, and the interpretation can be reported as a ‘finding’. And if the climate realists mostly answer “yes” then that can also be interpreted to indicate either possibility (think about it). So, the question itself is a demonstration that the survey is flawed; whatever result is obtained then the answer can be represented as indicating whatever the so-called researcher wants to assert about climate realists. I see your point. Given that meaning, it looks like it’s Tom Curtis who’s having his “Sister Lew Moment”. Thank you to all of the people who have pointed out the difference between “smoking causes cancer” and “smoking increases the risk of cancer”. I too believe that smoking only increases the risk of lung cancer, and lots of other health problems. My father was a smoker for 40 years and died from lung cancer. The VA also determined that he had (possibly) been exposed to Agent Orange in Vietnam, and ruled that as the cause of his condition. Who knows why he got lung cancer? Either smoking or Agent Orange or both or neither (he was also a farmer who handled a lot of pesticides). I have no idea, but I do not think that smoking automatically causes lung cancer, any more than I think Dad’s possible limited exposure to Agent Orange(he was in country when it was used, but never knew of direct exposure) caused his lung cancer. Hey Lew: Bring it. Wear kevlar. You’ll need it. That being an election year in the US, I wonder why the question are you Demo or Repu was not asked? I have to disagree with Richard Courtney. The detailed molecular mechanisms by which smoking causes cancer are quite well understood. It is a direct cause-effect relationship. It does not manifest in some people because of their genetics, differences in exposure levels, higher baseline levels of cellular anti-oxidants, pre-existing enhanced function of a tumor suppressor gene, and probably most important, chance. Reactive chemical intermediates and radicals can be found in everyone who smokes above a certain level, and given enough time, these products will cause mutations of DNA, which will produce cancer in a significant percentage of people. The probability of one mutation in one cell is probably reasonably high, but the probability of 3 and usually more (6-7) mutations of exactly the right type in the same cell, which is required to cause cancer, is much lower, so most people do not develop cancer. However, in those who do, most cases were directly caused by constituents of smoke, which are metabolized to reactive intermediates which cause mutations which lead to cancer. Nevertheless, this question, like most others in the survey is worded in a manner that people who are particularly thoughtful and detail-oriented would answer like conspiracy theorists, just because the premise is not properly stated. Instead, they assume they are accusing Lewandowsky of dishonesty, where the accusation actually lies in the realm of incompetence. I doubt they misunderstood Steve’s comment. Lewandowsky will now point the moderated (so nobody can tell what was originally there) comment and claim that Steve was unjustly accusing him of personally faking the data. So many prats, so few years. Either psychology PhD’s or just PhD’s in Australia are getting cheaper. Lewandiowski needs to ask for a refund of his fees from whomever he purchased his degree. This is a critical issue for those who seek to tar climate realists as kooks. The Team and its media minions have focused very heavily on Heartland Institute’s work in the 2nd hand smoke issue. And almost needless to say, they misrepresent that position, in a way that people here are suspecting Lewandowsky seeks to do, too, in order to show people who use CAREFUL, PRECISE and/or CIRCUMSPECT language in a scientifically appropriate way, to be nuts and kooks. I wish I could be so accomodating, but I think they understand perfectly what the word fake refers to in McIntyre’s question. In other words, it was “more practical” to allow multiple replies by the same respondent (an allowance highl likely to be exploited), than to disallow a few who share a computer. I don’t know how dim Lewandowsky is, but he can’t possibly be so dim not to know what McIntyre is referring to with the phrase “fake data”. Lewondowsky is behaving like a lout. If you think that anyone could consider you to not believe in the link between smoking and cancer, how do you think we feel here at the Galileo Movement being branded anti-Semitic when our own families are Jewish! We placed the following text on the Lewandowsky’s article to help try and defend our organisation. “The Galileo Movement is horrified that the fabricated smear by the SMH suggesting The Galileo Movement as anti-Semitic is still being reported and referred to as fact. Anti-Semitism is alien to The Galileo Movement which is made up of a group of unpaid volunteers having a single, published purpose – to rid Australia of the ‘The Carbon Dioxide Tax’, its derivatives and the means by which such negative, economic and socially destructive legislation may be reintroduced. Both the Directors of the Galileo Movement have the credentials to dismiss any challenge of them having anti-Semitic opinions or attitudes having strong Jewish association, including John’s wife being a Holocaust survivor. Lewandowsky … what gave him the idea that Pielke Jr. is a climate skeptic? The problem with Dr. Lewandowsky (or whoever their mod is), they don’t realize what snipping a single word does – they would have been better having an SkS moment (re-word the ENTIRE message to make themselves look good). When a message is left that says “As I’ve mentioned at Climate Audit, the substantive issue is the reliance on…data in the survey”, it makes people want to fill in the blank themselves. The moderator didn’t help much, in fact, made it worse – “Please refrain from accusations of dishonesty (snipped) in this venue”. So I can say that Dr. Lewandowsky is a real (snip). Just because skeptics don’t agree with you doesn’t mean there’s something flawed within their psyche. It’s really more a matter of crossing a convincing personal evidentiary threshold for acceptance as well established reality. The simple truth of the matter is that if one wants global warming to be anthropogenic and catastrophic then ones threshold for evidence is lower than someone that doesn’t. If ones importance (or personal finances) in the grand scheme of things increases with increased perceived danger from climate change then ones threshold for accepting evidence of potential risks from climate change decreases. I’m convinced we landed on the moon. I’m convinced the world has warmed since pre-industrial times. I’m not convinced the warming is primarily anthropogenic even though, admittedly, there is some supporting evidence. 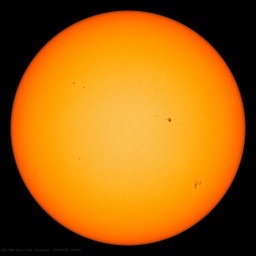 Since I don’t particularly want the warming to be man’s fault nor does the warming being man’s fault increase my wallet or stroke my ego, my personal evidentiary threshold has not been met with the paltry evidence presented thus far. I’m not convinced the warming will necessarily be catastrophic even though, admittedly, there is some supporting evidence (if you call what basically amounts to the guesses of those experts most to gain from the perception that it is necessarily catastrophic evidence). Since I don’t particularly want the warming to be catastrophic nor does the warming being catastrophic increase my wallet or stroke my ego, my personal evidentiary threshold requires more evidence. Similarly, I’m not convinced there’s extraterrestrials (UFO’s) visiting the planet even though there’s some evidence to support it. While the vastness of the universe certainly supports the notion that life may exist out there somewhere, it also minimizes the chances of being noticed and there’s also the possibility that Earth is uniquely life bearing even among a near infinite number of other planets just as there’s only one 42 amongst an infinite number of whole numbers (as far as we know). What does this tell us about the good professor? I guess I’m a nutter now, but I just realized that Freddie Mercury was either a time traveler or precognitive. Hehehe. Lewandowsky has produced a piece of work that might cause first year social science undergraduates to blush with shame. 1. What was sent to them. 2. What the response was. “he replied to the initial contact” could mean anything from an autoresponse (I’m on holidays…) to a request for additional information (that itself wasn’t responded to). Yes, I agree the smoking question is at the heart of what is wrong with the survey as Steve McIntyre has pointed out. I also agree that scientifically literate responders would understand the poor wording of the question wrt the actual link between smoking and causes of cancer. My point (obviously poorly made) is that this survey was not aimed at scientifically literate responders but was seeking an emotional/ gut response from “conspiracy theorists”, and arguing the toss about smoking/ lung cancer, however objectively and rationally, takes the emphasis off how bad the survey and its interpretation was, and allows The Lew to claim that skeptics really do deny the risks of smoking. The questionnaire’s questions are simplistic to the point of being meaningless. I smoked around 30 unfiltered cigarettes per day for over 50 years, but after moving to London(UK) after most of a lifetime lived in rural and small-town NZ, After a few years there I became quite concerned about the air quality so I quit smoking. Sniffing and tasting avgas from jets passing overhead every minute in daylight hours, on average, was the game-changer for me, and reading the mortality figures for non-smokers in Greater London compared with rural areas helped me decide to stop. I have always believed that cigarette smoke is only one of many possible causal factors for lung cancer. Since returning to NZ, I greatly appreciate the vastly superior quality of the air we breathe here..
Dr Lewendowsky not only exhibits all the attributes of of a charlatan but also demonstrates the intellectual vacuity of his acolytes. Kudos to Tom Curtis for calling Lewendowsky’s nonsense as he saw it! The reaction to the Sister Souljah moment comment is being misinterpreted. Souljah said a very bad thing. No question about it. The SJ moment came when Clinton called her on it, and rightly so, and was the first SJM. We are a few good scientists away from having a Sister Souljah Moment regarding Gleick – a condemnation of Gleick and his self-cratering activity involving the Heartland Institute. Had they done so it would absolutely have been a Sister Souljah Moment. It is a shunning of the offender, not any approval for Sister Souljah. If anything it is a reminder of how she earned this dishonor. In fact, the exact opposite of a Sister Souljah Moment is a Peter Gleick Moment where an egregious act has occurred and no thunderous condemnation from his support community followed. There should probably be a Peter Gleick Moment page on wikipedia as a taunt to those to ignore the elephant in the room. don’t miss the chance to vote for “Climate Prat of the Year” at Pointman’s — Prof. Lewandowsky is coming on strong although Julia Gillard is still in the lead. There are several (un)worthy candidates! fwiw my vote was for PM Gillard, because as a head of state she is in position to do so much ongoing damage with her carbon tax, etc. I’m American and this poll is Australian-focused but still of interest to all who care about truth, justice, and the American Way. p.s. correction, the “CA thread” at beginning of hyperlink is a mistake, an accidental leftover from a prior post with a hyperlink, sorry. Also, I said the poll is Australia-oriented bc I was thinking about Gillard, Lewandosky, and Flannery, but Peter Gleick and Jim Hansen are also finalists, as is Naomi Oreskes, so North America is well represented among the dismal options. You can get the details from the Climate Audit post on the subject. What appears to be the full exchange between the assistant and Dr. Pielke Jr has been posted by Steve McIntyre in the thread, including the original email. If that’s representative of what was emailed to the other recipients, I’m not surprised that most didn’t respond. The original email looks too much like a scam – a link with inadequate explanation of what it is for (and no mention of Prof Lewandowsky by name, which is why all of them initially denied receiving the survey). …Sooner or later, and not a pretty way to go either. Yes. But go read the Sunstein article, and look at the other things I mentioned. The difference is: we everyday citizens are either too unintelligent or too psychologically limited to govern ourselves; therefore we need government to correct many things, such as filling our heads with “correct” knowledge regarding global warming, and government having an overt role of correcting misguided issue-groups. That is different from FBI (or whomever) infiltrating groups – either in the official but secret capacity, or in the abovetopsecret way – to maintain some knowledge and thus some chance of control of threats to domestic tranquility. re you reply to my comment. Please think about my walking in the forest or along the country road analogy. This issue of determining causality not only confounds the survey question, it is also a basic issue in many scientific issues including the science of AGW. Is it just me, or are there a bevy of trolls trying to insinuate that WUWT bloggers here actually think along the lines that Lew tried to fake, by repeating such nonsense? Sorry guys, the tone just got smeared with it. Please move along and spread it elsewhere. This is all just a silly joke. Nothing to get excited about. It is kind of disconcerting though that he would actually take the time to write it up as a journal article. I just read thelastdemocrat’s comment and I must say that I completely agree with the comment that we shouldn’t burden the next generation with guilt over the way we have ‘polluted’ our environment. Our PM is very fond of the key message of ‘carbon pollution’. Every time she says it I cringe because children growing up now are going to think that a key component of life on this planet (CO2) is pollution. My wife recently went to a hairdresser who was advocating removal of all CO2 from the atmosphere. When my wife pointed out to her that plants actually require CO2 to grow she was stunned. She actually thought that CO2 was such a pollutant that it was bad for the environment. thelastdemocrat – Some more good points, and yes, I generally read CS (and others) on sight anyhow. I think what we’re looking at is The Paradox of Democracy – the requirement that the populace who vote are fully informed about what they’re voting on, and capable of balancing the pros and cons so as to come to a rational conclusion. Until some point (sometime around Galileo), it was allegedly possible for one intelligent person to have the whole of known science at their fingertips to help them assess what was likely to be the most useful path to study a topic. Now, there’s so much of everything that not even an expert in the field can manage that, whatever the field. What chance does poor old Joe Public stand? I do know whereof I speak. When I was much younger and more innocent, I took a Philosophy degree, to try and understand the underpinnings of science better and perhaps get a few pointers on the ‘Eternal Verities’. Naïvely, I expected answers. Three years later, I left Uni with my head spinning with vastly more questions but no answers at all. Now, at sixtysomething, it’s more like terminal confusion! So, yeah. I really do appreciate that nothing is ever that simple. Fascinating to talk about, though. On a completely different topic: I’ve noticed lately that now, we get comments here from ‘more soylent green!’ fairly often, but we never see the original ‘soylent green’ anymore. Has ‘more’ eaten>/i> him? * 1. An economic system based on free markets unrestrained by government interference automatically works best to meet human needs. This pretty clearly shows us there was no randomization or worries about order effect. They kept questions grouped similarly and simply moved them around in blocks. There were exactly 6 questions in the “free market” group and only 5 questions in “am I happy” group … and room for only 6 or so questions on the first page. The lack of a 6th question on the one page pretty much proves the questions were not truly randomized but were kept in their order with their orig groups. Basically no value I can see to this – no attempt to address order effect. Paul, Latimer, and others, don’t fall into the trap of conflating arguments about smoking with those about exposure to secondary smoke and smoking bans. This is a trick that the tobacco control industry uses to discredit those questioning the science behind secondhand smoke exposure and smoking bans. There are VERY FEW who question the smoking/cancer link. There are FAR MORE who question the degree of threat from secondhand smoke and the need for smoking bans. Barry’s quote about the excuse for censoring/shutting-down debate on climate was “Discussion of this topic is becoming a little too heated.” I think the moderator there was a bit more colorful in describing those of us questioning the tobacco control industry’s “science” … how many of the folks here at WTD have been treated to “scum,” “villainy,” “apologists,” (not to mention “murderers,” “child abusers,” “drug peddlers,” etc on other boards) as a matter of normal discourse because of their views on climate science? I would like to point out, not to stir up a controversy but purely as information, that most accidental changes in the DNA are single-strand defects. Repair enzymes can repair most of them; by replacing the broken amino acid with the right counterpart to the intact partner amino acid. Single strand defects happen all the time; once a second a C14 atom in some DNA strand in the human body turns into Nitrogen by radioactive decay whether you’re a smoker or not. Nearly all of these defects get repaired. If a single strand defect happens during cell division, this repair mechanism obviously is out of luck. So I would suppose that most unrepaired defects are caused during division. We all know smoking can and very often does cause cancer. In fact that there is a high likelihood of it for many people. That means that the rational response to this question is “Agree” or “Strongly Agree” depending on your experience and beliefs. It would be very rare for anyone to purposely choose “Strongly Disagree” in the real world. Because of that, and that it is extremely unlikely anyone would normally choose “Strongly Disagree” … any answer of “Strongly Disagree” should be reviewed as suspect. The ratios for that question actually show a “Disagree” should be suspect as well. Any survey that includes a “Disagree” or for sure one that includes “Strongly Disagree” as answer to this question would need serious review. The question itself is not really the problem … certainly it could have said “Smoking can cause cancer, making it easy for all to likely strongly agree, but its present wording is accommodated with the “Agree” or “Neutral” choices. The question is a good quality control. At the risk of being accused of discussing results while survey was running 😉 I’ll carefully say Steve McIntyre’s conclusions are well supported after reviewing “a lot of” returns in the re-created survey. Lewandowsky’s email to Roy Spencer says that “(his research assistant) contacted you at the time to ask whether you would post a link to one of my research projects on your blog”. Not a new observation, but there doesn’t appear to have been any reference to Lewandowsky in the original contact (the same goes for at least some of the other approaches to ‘sceptic’ blogs). It use to be “GIGO” – Garbage in, Garbage out. But with the proliferation of all these fake surveys (having no basis in any scientific statistical sampling methods), I guess we have a new acronym now – MIMO – Moron in, Moronic out. “You have raised a very valid point. We are aware of methodological issues, one of which is dealing with repeated replies. I have an image of many grad and doctoral students, along with the post-docs and junior faculty, busy for days on end, repeatedly ‘taking the survey’ and brown-nosing their seniors. I wonder …..
Actually the order of the questions greatly affects the answers to the following questions. Pollsters know this and when they want a particular response, they order the questions accordingly. Subtle changes in wording will also influence answers, but it appears that the questions in this Perfessor Lew’s survey are identical, so this should not be an issue here. We also know that the answers can be shaped by the choices presented. Let me see if I understand Professor Lewandowsky correctly by pretending that I’m going to write a similar paper. I want to write a paper about the thinking involved with Issue X. Specifically, I want to write about the thinking involved with people who are Pro-X. So, I send a survey request to people that run Pro-X blogs, but none of them are willing to participate. So, I send the survey to people that run Anti-X blogs, collect data, and make claims about Pro-X thinking. Forget ethics violations. Quite simply, this guy is neither logical or smart enough to be a university professor. Isn’t it reasonable to assume that some people would answer “Strongly Disagree” because it’s not the failure to wear the seatbelt that actually causes death? Could I then conclude that these crazy people ignore massive amounts of data and refuse to believe that wearing a seatbelt can help save your life in the event of a highway collision? Voting irregularities detected in the climate prat of the year award. shoddy collection and analysis of online survey data. written and re-submitted to more rigorous peer review? National Climate Change Adaptation Research Facility. What about me? Lewandowsky, S. (2010, September). The Psychology of Climate Change. Lewandowsky, S. (2011). Popular consensus: Climate change set to continue. at the Australasian Mathematical Psychology Meeting, Melbourne. There’s a problem here. The work listed in his vita appears to be of a much higher quality than his current survey. There is no doubt that he should know better. Perhaps he is the victim of identity theft and someone else is behind this survey and the unprofessional treatment of Steve McIntyre’s attempts to help. What other explanations are there? blackmail? mid-life crisis? brain tumor? joined a cult and was brainwashed? or just sold out? Just think. If all the Lews, Manniquins, Hansens “et al” would just shut up, we’d have to come up with our own jokes. But this time, they’d be funny! Having read a few more comments, there is a link with many of them to do with the cause of cancer. My previous comment above (2.19am) answers many of them, because ANYTHING which damages the body MAY cause cancer, this then manifests itself when the body tries to mend itself without the proper materials, not ‘knowing’ when to stop the repair, and then running into uncontrollable growth of tumors etc. If you have an inquiring mind read a bit about it and then decide. I made a comment on the survey about “absurd questions”. I should have added “… but thank you for inviting me to take it.” Wishing you a “big N”. Dr. Lewandowsky has provided us with still another example of the fact that it is easy to design a study to “show” something or even “prove” something, much more difficult to design a study to “find out” something. If you wanted to “find out” what sceptics think, how would you go about it? Count me among the “smoking impacted” skeptics. Dad smoked. Unfiltered Camels. Died of lung cancer. Mom did not smoke, but spent many years seated next to smoking Dad in living room and car. Died of lung cancer. Me? Well, turns out that when the Dad smokes and the Mom does NOT smoke, there is a much higher rate of the child being allergic to tobacco… I have a strong allergic response to tobacco smoke that has plagued me my whole life. One day, about 5 years old, after all day at school, away from smoke, I breathed through my nose… It was a rare and strange experience… Later I learned to avoid smoke at all times and leave the house as much as possible. Even today my eyes go quite red around tobacco smoke. I can not go to bars or shows where smoking happens. (Only in the last few years with anti-smoking laws have I been able to go to such places and not suffer). It is incredibly offensive to me when the Warmistas use that smoking line, as it is a flat out lie. That the survey shows positive results is strong confirmation that the survey has fake data.